Astonishingly, at least 40,000 of the paintings in the British national archive are not attributed to any specific artist. They are unrecorded and unknown. 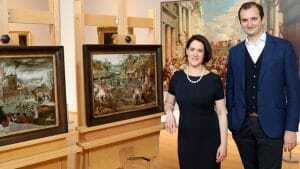 The three-part series The Art Detectives follows one of the world’s leading art detectives, Dr. Bendor Grosvenor (Fake or Fortune? ), as he tracks down lost and hidden public treasures from museums and galleries across Britain. With the help of art historian Jacky Klein, he uncovers the history behind each piece and restores them for public enjoyment.